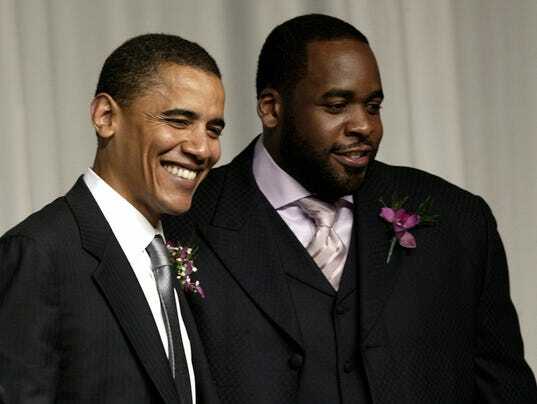 President Barack Obama will visit Kwame Kilpatrick’s federal prison in Oklahoma on Thursday, offering a reminder of how far their careers and fortunes have diverged since both were viewed as rising political figures eight years ago. Obama is scheduled to meet with inmates and law enforcement officials during a visit to the El Reno Federal Correctional Institution outside of Oklahoma City. The visit comes amid the president’s push to reform criminal sentencing laws, particularly for low-level, non-violent offenders. “I don’t expect any interaction with the former mayor,” White House spokesman Eric Schultz wrote in an email Tuesday. Kilpatrick, 45, is serving a 28-year sentence at El Reno for racketeering and other crimes related to the Detroit City Hall corruption scandal. He is scheduled to be released Aug. 1, 2037. Kilpatrick has appealed the convictions and is awaiting a decision by the 6th U.S. Circuit Court of Appeals. His family has expressed interest in requesting a presidential pardon, but Kilpatrick won’t get one from Obama. That’s because federal prison inmates must wait five years before requesting a pardon. Kilpatrick was convicted and sentenced to prison in October 2013. The two have crossed paths before. Obama, a U.S. senator from Illinois, met with Kilpatrick in Detroit in May 2007 and sought the young mayor’s endorsement during his run for the presidential nomination. The relationship cooled a year later. In September 2008, an Obama spokesman said Kilpatrick should resign amid the text-message scandal. "(Obama) believes it is time for the mayor to step aside so that the city can move forward and get back to business,” Obama spokesman Brent Colburn said. Kilpatrick was in jail when Obama was elected president in 2008. In his memoir, Kilpatrick said he “hated on” Obama as he watched election coverage from his jail cell. Kilpatrick wrote that he felt pride at seeing a fellow African-American win the historic election, but he writes that feeling later turned to enmity.